A fascinating experiment in more-than-human viewpoints in computer games. 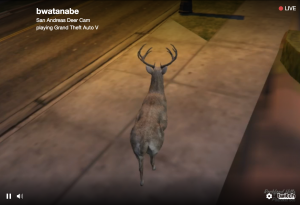 San Andreas Deer Cam is a live video stream from a computer running a hacked version of Grand Theft Auto V, hosted on Twitch.tv. 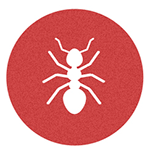 The hack creates a deer and follows it as it wanders throughout the 100 square miles of San Andreas, a fictional state in GTA V based on California. The deer has been programmed to control itself and make its own decisions, with no one actually playing the video game. The deer is ‘playing itself’, with all activity unscripted… and unexpected. In the past 48 hours, the deer has wandered along a moonlit beach, caused a traffic jam on a major freeway, been caught in a gangland gun battle, and been chased by the police.